What exactly is preventing the double-wall design from flexing in the same way if that's the intent? Yes and someone found a Taiwanese description. https://www.pinkbike.com/forum/listcomments/?threadid=212346 Revised Charger 2.1 damper. New SKF seals. Maxima oil. They're likely making that statement in reference to Stamina vs "x" other suspension design in a shorter travel format. So while they don't give up any liveliness/efficiency on Stamina vs. "x", they can gain liveliness/efficiency with a shorter travel version of the Stamina itself? You can get random-brand Chesters on Amazon for $25. Been on a pair of "Eagle Riding" Chesters for a couple seaons and they're rock solid. Cedric is involved with Production Privee, isn't he? Maybe something new with/for them? Posted in "Stans Sealant Breakdown?" Love the old GT mountain bikes. 2000 Aggressor was my first mountain bike. I threw a Judy XC on there and upped travel to a whopping 100mm. Snapped the stock BB spindle and threw an ISIS Truvativ set in. Loved that bike. I was careless and got it stolen my senior year at college. Miss that bike. I still keep an eye out on CL for it. If you ask me, though, even sexier are the mid-school GT/Robinson BMX bikes like the 1997 Speed Series or any of the alloy Robinsons. Absolute classics. @jcc0042: Also looks like it may have a different upper link? Again, tough to tell due to the angle. 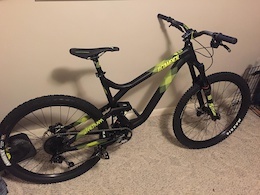 @gnarnaimo: Trail bikes? Giant Stance. Cannondale Habit. Pretty sure the Stance's are notorious for cracking. @ratedgg13: The Time MX's are also available as Mavic Crossmax XL. I got a pair that are the Mavic equivalent of the MX2 and I love them. Super cheap as well.